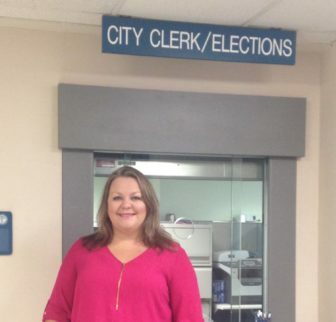 City Clerk Jennifer Shuster oversees Election Day in East Lansing. Bob Ulrich says he will do “anything and everything to help people vote.” For the past 10 years, he has been doing just that by working as an election inspector for the City of East Lansing. Ulrich was one of roughly 140 election inspectors who worked the polls during the August primary, and East Lansing City Clerk Jennifer Shuster is in need of even more election inspectors to help with the Nov. 6 general election. Due to the high number of expected voters, Shuster hopes to hire 180 people to help. Election inspectors are stationed at each of East Lansing’s 17 precincts, checking voter identification, distributing ballots, handing out stickers, and keep precincts organized, allowing Shuster and her staff to troubleshoot as problems arise. Election inspectors will be paid $10 an hour, with precinct captains earning $12 an hour. Ulrich does not work elections for the money, though. “I think it’s a civic responsibility not only to vote but to serve your community,” said the retired principal and teacher. Ulrich’s interest in elections began early. His parents were election inspectors, and he became a fourth-grade social studies teacher for the East Lansing Public Schools, where he tried to impart a message of civic engagement to his students. At that time, polling locations were often in school cafeterias and Ulrich made a point to take his students to see voting in action. It was not until the 2008 presidential election, however, that he was able to work an election himself. In 2008, Ulrich was a member of the East Lansing Receiving Team. Its primary responsibility was to go through a checklist as ballots arrived at City Hall after the precincts closed at 8 p.m. and until 2 a.m., he made sure all ballots were accounted for and secure, and that there was a record of all the election inspectors who worked that day. Not frightened off by his baptism by fire, Ulrich has continued to work at Precinct 2 in subsequent elections. He now recognizes many of his precinct’s voters and enjoys seeing his fellow poll workers at every election. In addition to being personable, Ulrich tries to be patient and organized to efficiently solve problems that arise. In past elections, Ulrich says machines have malfunctioned, voters showed up at the wrong precincts, and on particularly humid days, ballots have stuck together. Whatever the problems, he does not leave his precinct until all ballots are accounted for. While precinct captains spend the day on their feet, Ulrich says there are plenty of other election inspection jobs, including checking photo IDs, distributing ballots, and thanking voters with “I Voted” stickers as they leave. Potential election inspectors will be taught how to use voting equipment and other election day procedure in a mandatory training given by Shuster and her office, beginning on Oct. 24. Applications to be an election inspector are due to the City Clerk’s office by Oct. 19 and can be found on the city’s website. Democratic gubernatorial nominee Gretchen Whitmer spoke to the Michigan State University College Democrats at Wells Hall on Tuesday, Sept. 18, with running mate Garlin Gilchrist and the Democratic candidate for Michigan’s Eighth Congressional district, Elissa Slotkin.